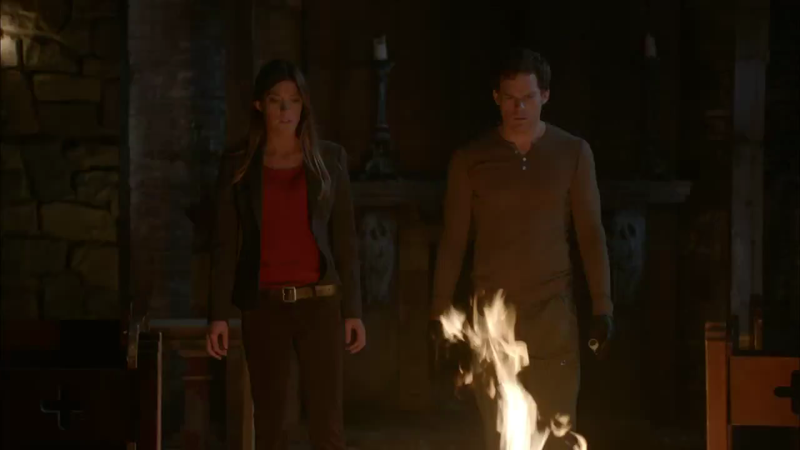 Yesterday Showtime released on YouTube the first sneak peek for the new season of Dexter which contains new footage. 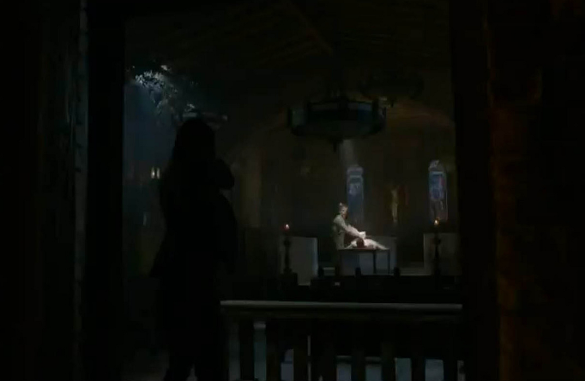 Three seconds of a super-fast motion slideshow featuring images from Season 7 were enough to answer burning questions about what comes next, especially of episode 7.01 "Are You...?". Hit the jump to read the... obvious spoilers of the sneak peek. -As you can see in the photo above, right after the "Oh God" of the season 6 finale, Deb points the gun to Dexter. -Deb helps Dexter to burn Travis' dead body. -Hours later police officers from Miami Metro are investigating the church. 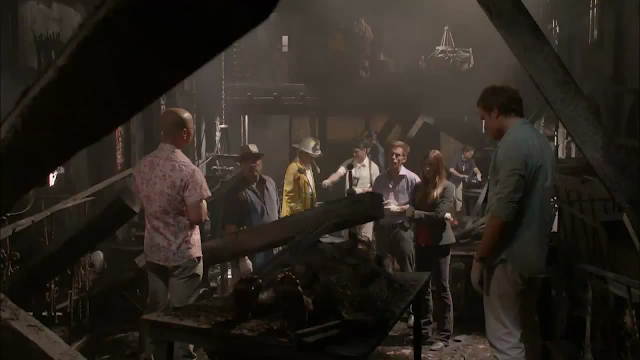 We can see Masuka, Batista, Deb, Dexter and Quinn standing in front of Travis' burnt body. -Lieutenant Morgan says to the reporters her theories regarding what happened in the church last night. Exacly what I was thinking. Well, I am sure they did not stand IN the church while it was burning, and I am sure the odor of smoke is so strong in the church they can't smell it on anyone's clothes. That's a pretty minor detail to worry about in a show where you are juggling ridiculous ideas and concepts. There is no "reality" in Dexter at all - never has been. But the writers are doing "character" stuff and they really aren't trying to make any of this realistic - truly, when you really look at it in the right light, Dexter and Breaking Bad are nothing more than the most badass soap opera's ever written. I don't watch Breaking Bad because it's realistic, but because it's awesome (and the only way to survive until September 30). hahaah no soap opera structure, no way....breaking bad and dexter are both great shows whose writers have built a very special universe for its characters. when i want realism i'll watch something like los olvidados. different stuff here, different cinematic approach, it would not work differently. check out the colours used in these two shows, it's as if they're taking place in another reality. both brilliant. "it's as if they are taking place in another reality"
That is exactly the style that was created for serials and soap operas in the 1940's and 1950's :) And that is not a dig at all, it's merely a "writing tool" and it's one of the reasons the shows are so immersive. My point is that there has never been any attempt by those two shows to write "realistically" so anyone who is complaining about this or that not being realistic, like "why aren't they sniffing Deb for smoke" is being a little silly, IMO. i don't see the connection. not at all. then again i havent watched 1940s soap operas so i'll just leave it at that. we do basically agree on the fact the non realistic approach works and that they were never going for realism, so i'll just leave it at that. You can use microwaves to warm a bagel in your kitchen. You can also use microwave weapons to blow billion dollar supersonic fighter planes out of the sky. So, you see, there is an example of one scientific theory that be used by a housewife in her home, or it can be used as a high tech frightening weapon by the military. needle here. watch it, buddy. :) very good. why did they burn the body? If they just dumped him into the ocean there would have been one less storyline. Deb has a pitifully low Completion Rate. If they find Travis' body, that's about ten solved murders there. at some point dexter went to wash up while deb cleared the church and called metro cause she is in the same clothes.. but dex is not.. So the theory if La Guerta finds the blood slide is what we are waiting for.. It all makes sense ;) I just cannot wait, and there are only 88 days left until 30 SEPTEMBER! I'm guessing that they burned the body so that the case could be closed for Deb and Travis wouldn't just go "missing" as Dexter had probably intended. LaGuerta has Deb under her thumb now that Matthews is out of the picture. And her closure rate on cases has also been called into question. It might actually work out in Deb's best interests to protect Dexter. They could trade off on criminals. Some for Deb to take down legally to keep her arrest rate up and some for Dexter to bring down on his own. I'd like see Dex and Deb arguing whether to kill someone or just arrest him. First they kill someone together, and then they and up in bed. I said this in a comment in a different post!!! To anonymous (3rd July) Breaking Bad is totally awesome. But you should start from Season 1. That's exactly what I did. I watched all four seasons within a few weaks and then realized that it was only a few months until season 5.